Kindly note:Please be sure your LCD panel is the same LTM220M1-L01 before ordering. If you have other similar LCD panels, please advise the detailed LCD model no. for checking compatibility, thanks! M.NT68676.2A controller is suitable for Asia-Pacific market. It can support LED/LCD panels which resolution is up to 2048x1152. M.NT68676.2A controller can synchronize with computer automatically. Synchronization requires the synchronous signal which horizontal and vertical sync are separated. M.NT68676.2A controller can support dynamic contrast control, headphone input and Digital volume control simultaneously. Step 1: take away the old LVDS cable and old inverter(if there is) from the LCD panel. 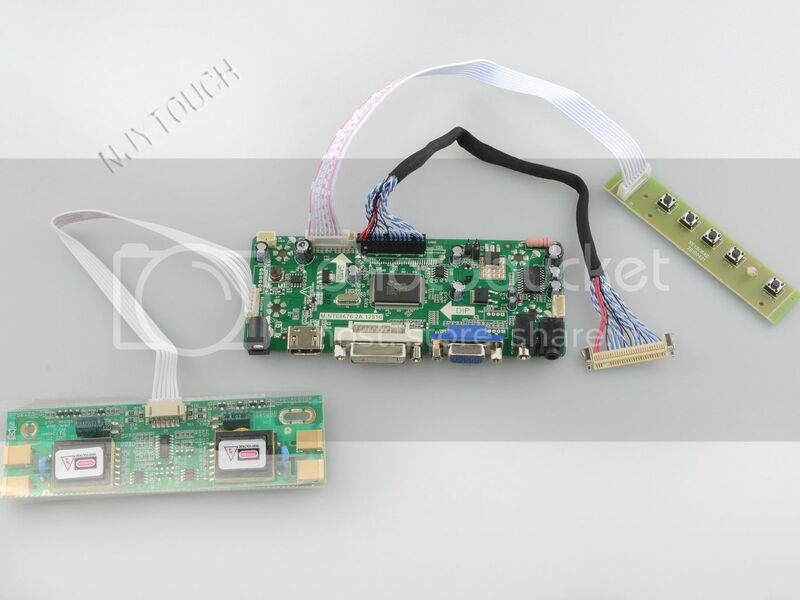 Step 2: connect our LVDS cable and inverter connector to the LVDS interface and backlight connector on your LCD panel. Step 3: connect VGA cable/DVI cable/HDMI cable to controller board and PC/HDMI device. Step 4: input power of 12V,4A.